Prize comprises of Flights from Johannesburg, Bloemfontein or Durban to Cape Town, return. Shuttle transfer to and from the airport to the farm. Accommodation at House on Enon for 2 nights, breakfast included daily. Shuttle service from the farm to the Wine on the River festival, Weekend pass to the Wine on the Rivier festival and dinner at House on Enon for both nights to the value of R25000. The Promoter is Zandvliet Wine Estate (Pty) Ltd, herein after referred to as “the Promoter”. There is 1 prize that can be won. Prize comprises of Flights from Johannesburg, Bloemfontein or Durban to Cape Town, return. Shuttle transfer to and from the airport to the farm. Breakfast daily included. Shuttle service from the farm to the Wine on the River festival, Weekend pass to the Wine on the Rivier festival and dinner at House on Enon for both nights to the value of R25000. Prize image is for graphic purposes only. Actual details may vary. The SMS entries are open from 9am on Tuesday 1 August 2017 till 11:59pm on Saturday 30 September 2017 and the online (website & Facebook) part of the competition from 1 August 2017 to 30 September 2017. 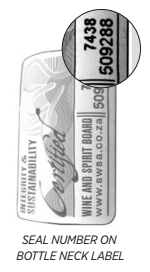 The first 6 digits of their South African Identity Barcode Number, Online Visit www.zandvliet.co.za or https://www.facebook.com/ZandvlietWine and navigate to the competition page (from your PC or mobile phone) or Facebook app. Complete and submit the online form to enter the draw to win the Grand Prize. Every valid entry will be entered into a lucky draw to win the weekend away. The Grand Prize winner will need to provide proof of identity, proof of purchase and date of birth in order to redeem the prize. The Grand Prize winner will be announced on the Zandvliet website and Facebook page. By entering the competition and/or accepting the prizes winners hereby indemnify, release and hold harmless Zandvliet Wine Estate (Pty) Ltd. and the Promoter and other, from and against any actions, claims, liability for injury, loss, damage of any kind resulting from the competition and/or prize.